The Yoga Book's innovative adaptive keyboard may be a good fit for schools. Lenovo plans to have three flavors of the Yoga Book—its innovative typing, writing, and drawing mash-up of a computer—in 2017. The company’s Android and Chrome chief, Jeff Meredith, recently confirmed to Laptop Magazine that a Chrome OS version would arrive next year after the website Chrome Unboxed reported in October that a “Yoga Book Chromebook” appeared to be in the works. The Yoga Book is currently available running either Android or Windows 10. Lenovo already sells Chrome OS versions of other devices in the Yoga line. The Yoga Book is unique because it encourages users to be “hands-on” with the device more so than any PC before it. Lenovo’s Yoga Book looks like a sleek 360-degree convertible, but open it up and instead of a traditional keyboard you'll find a flat, matte touch surface. That surface can switch between a backlit touch keyboard and an empty surface for digital ink at the touch of a button. There’s also a special case that attaches to the touch surface to write or draw on A5 paper. All physical inkings are then reflected on the display for apps such as OneNote. When the Chrome OS version rolls out it will keep most of its pen-based chops. 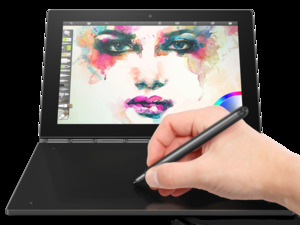 That includes the ability to write on paper or use the “Create Pad” functionality to draw with digital ink on the touch surface. There’s no specific release date for the Chrome OS version of the Yoga Book, but Tom’s Guide says it should roll out by “midyear.” That could mean we’ll see it around July or August in time for the back-to-school rush. The story behind the story: The arrival of a Chrome OS Yoga Book suggests Lenovo’s days creating PC-like devices loaded with Android could be numbered. With Google building Play store functionality into Chrome OS—something the new Yoga Book Chromebook will almost certainly support—there’s little need for an Android variant. Lenovo’s Meredith said as much to Tom’s Guide. “Over time, we probably see the Android and Chrome versions melding together,” he said.